Formula One officially kicked off its preparation work for the 2018 season which starts on the 25th March in Melbourne, Australia. As usual, Barcelona serves as the venue for the eight test days. Despite to the trees being in blossom, the plunging temperatures of four-eight Celsius degrees meant, teams could only checked the basic working functions of their new race cars. Conducting any performance runs or tyre testing was almost impossible due to the surprisingly low ambient temperatures. Red Bull’s Daniel Ricciardo topped the timesheet with a 1:20.179 which the Australian set on the Medium tyres. The five-time GP winner was also the most diligent driver with a tally of 105 trouble-free laps. 2007 champion Kimi Räikkönen completed 80 laps, the fastest of them in 1:20.506 on Soft tyres. The Finn’s work concentrated mainly on acquiring data and pit stop simulations. Lewis Hamilton: “"It's great to be back in the car after three months off, but unfortunately we didn't get the chance to complete many laps today owing to the bad weather," the four-time World Champion explained. The track was very cold in the afternoon, meaning it was tough to get any sort of heat into the tyres. The tyres weren't really working in these temperatures, so I could not get a real feel for them. I didn't really get the chance to push in the car and go up to top speeds as the conditions were so bad. It's hard for me to say a whole lot about the car because I did not drive it for a long time, but the initial feeling is good." The first day of testing ahead of the 2018 FIA Formula 1 Championship was productive for the Alfa Romeo Sauber F1 Team. Marcus Ericsson was behind the wheel of the new C37, focusing on completing aerodynamic and mechanical tests. The Swede was able to get a first impression of the team’s new car, completing 63 laps overall. Marcus Ericsson: ““It was very exciting to be back on track and drive the C37. Over the course of the day, we gathered some interesting data. The C37 is based on a new concept, both mechanically and aerodynamically. It has been interesting to see how these changes translate to the car’s behaviour on track. We completed a few good runs, however, had to cut the afternoon session short due to the tricky weather conditions at the Circuit de Catalunya. We dealt with low temperatures of both the air and the asphalt, which made it difficult to get the tyres to work properly. The Grove-based teams two race drivers both got the chance to try out the 2018 Williams car equipped with the Mercedes-AMG F1 M09 EQ Power+ power unit. Sergey Sirotkin and Lance Stroll rounded off a total of 74 laps on the 4655m long Barcelona race track. Lance Stroll: So far, so good, which is always a positive thing on the first day. It is a new car, which means there are lots of things that have to be done to get on top of it, so it is good we had no problems this morning. We have a big programme and we want to get a lot of laps done in order to get us as well prepared as possible for the first race. As for the halo, to be honest, I am not a huge fan of the look, however, it is going to help save lives. If I am in the car and it is going to help reduce the chances of being injured I will definitely take that device and that is what the halo is doing. I am complaining about the looks, but at the same time I understand that the safety is important. After taking to the track for the first time last week in its one-off ‘Disruptobull’ livery for a filming day at Silverstone, Aston Martin Red Bull Racing’s 2018 challenger, the RB14, today returned to its familiar racing colour scheme as testing for the new Formula 1 season got underway at a cold (and late in the day, pretty wet) Circuit de Barcelona-Catalunya. And after 105 trouble-free laps, Daniel Ricciardo ended the day at the top of timesheet with a best lap of 1:20.179, set in the morning session on medium-compound Pirelli tyres. Sahara Force India launched its 2018 season today with Development Driver Nikita Mazepin the first to experience the VJM11 in Barcelona. The new car completed 22 laps, the fastest of them was a 1:25.628. Le Mans winner Brandon Hartley gave Toro Rosso’s 2018 car its track debut. 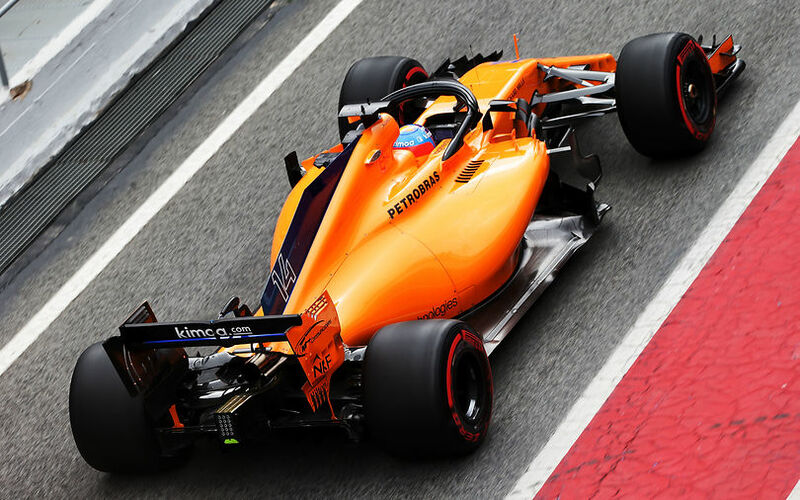 The new car equipped with the Honda power unit ran smoothly and completed 93 without any serious woes on the Catalunya track. Brendon Hartley: “It was a really positive day. We had no issues at all but we stopped early because of the weather, it was almost icy conditions out there. Everything felt pretty good from out of the box, we had some test items that we didn’t get to complete because of the weather, but getting through 93 laps on the first day of testing was a great start to the campaign with the new Toro Rosso-Honda (partnership). Balance-wise, we were pretty comfortable straight away but I still think there’s potential to unlock. I’m really happy with how the day went, I think everyone probably struggled with tyres, but doing one corner slow the tyres drop out of the window and it was almost like an ice- skating rink.